Father Tomas Fernandez was a visionary. As the pastor of St. Martin of Tours parish in Kingsville in 1950, he had the awesome responsibility of ministering to the spiritual needs of nearly 1,000 Hispanic, catholic families in Kleberg County. With the help of the Daughters of the most Pure Virgin Mary, he also ran St. Martin's School. Religious change was in the air, not only in Kingsville, Kleberg County, and Texas, but throughout the United States as well. In the southwestern United States, evangelical protestant traditional Latin-American Catholics were ready targets. 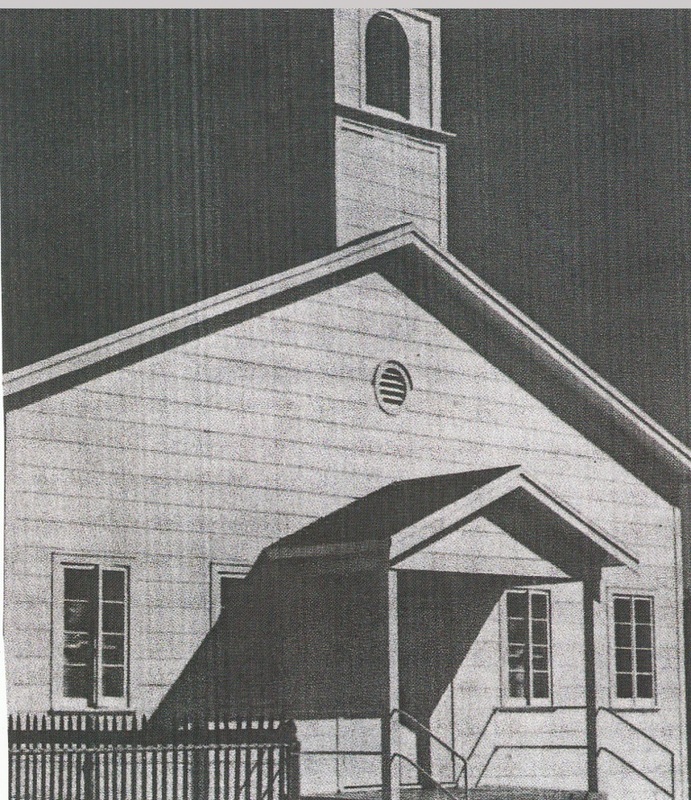 A number of small protestant denominations began to appear in the developing east side of Kingsville, and as they built their new churches, they began to evangelize to the people in the emerging neighborhoods east of 14th street, convincing some catholic families to join their churches. Father Fernandez countered by seeking out Epitasio Conteras and offering to buy three lots in the 1100th block of East Kleberg street with the intent of eventually building a catholic chapel there. St. Martin church was several miles from the location, and especially during inclement weather, many east side parishioners found it difficult to attend Mass or to send their children to doctrine classes there. Some families had no means of transportation and had to walk to St. Martin. Father Fernandez reasoned that having the chapel within walking distance would keep his flock in the Catholic church and out of the protestant churches a few blocks away, and he bought the property. But before he could start the chapel project, Father Fernandez was transferred to Holy Family parish in Corpus Christi and Father Jose Arratibel took his place at St. Martin. Under the energetic direction of Father Arratibel, sufficient funds were collected to build the chapel dedicated to Our Lady Of Good Counsel, at a cost of $22,000. Rt. Rev. Monsignor William H. Oberste, Vicar General of the Diocese of Corpus Christi, officiated at the dedication and blessing of Our Lady of good Counsel on Sunday, June 27 , 1954. Father Arratibel and Father Isidro Chateau assisted in the dedication. Until 1967, the St. Martin of Tours Assistant Pastor served the spiritual needs of the people of East Kingsville who attended "La Capilla," as the new church was affectionately called. An entry in Spanish in the St. Martin church daily journal by Fr. Chateau dated October 29, 1958 translates as follows, "-Rev. Father Terenciano Montero, OMT, assistant to St. Martin's parish, attended to the needs of Our Lady Of Good Counsel from 1954 to October 1958, with daily Mass during the week and o Sundays, besides leading in rosaries and giving blessings, and directing catechism for the children. From October 12, 1958, after Father Montero was transferred to San Antonio, Texas, Father Isidro Chateau, OMI, was put in charge of all Masses and catechism at "La Capilla". Father Isidro was an aging priest, a kind and gentle man of God who loved the people he served and who was loved in return by his parishioners. He wrote in his journal how he would be "taken and brought back" from La Capilla by "Mr. Mauricio Garza of 1239 E. Yoakum" for church services, especially at night because of failing eyesight. "But in the mornings", he wrote, "I go by myself in Father Jose's ancient Studebaker". The People of Our Lady Of Good Counsel had other zealous priests to lead them before being established as a separate parish: Father Olaizola, Father Blown, Father Rey, and Father Joseph. In an article written for the Oblate magazine, Mary Immaculate , Father Buckley pointed out, "The physical progress of the mission may be seen in the parish hall built in 1960 and in the catechetical center acquired in April 1964". Describing the simplicity, but impressive dignity of the church layout in the same article, Father Buckley wrote, "To your left, near the entrance, in a side wall is a niche or sort of small shrine. This is an idea which Father Arratibel incorporates in all his churches. Our Latin-American people have a fondness for many saints and many devotions. Their churches often fill up, over the course of years, with dozens of statues and images. In time these almost overwhelm the church. You see the beauty of this niche. All their statues and images are placed here. And the rest of the church can be kept neat and uncluttered". That shrine still exists today. In April 1967, Bishop Thomas Drury established Our Lady Of Good counsel as the third Catholic parish in Kingsville. Father Joseph Buckley, OMI was the first pastor. Father McDermott, Father Diehl, and Father Ryan served the parish as pastors in rapid succession. In September 1970, Father Thomas Fernandez was reassigned to Kingsville as pastor of Our Lady Of Good Counsel, thus having the opportunity to fulfill his vision of serving in the church for which he purchased land in 1951. He worked relentlessly after he arrived. With the help of his parishioners and his influence on his influence on his friends from Corpus Christi to help finance his projects, he started renovating the parish hall and the church. It was not unusual to see the men of the parish roofing the parish hall, or painting the church on Saturday mornings. The parish flourished under Father Fernandez, both materially and especially spiritually. Only advancing age and failing health kept him from doing more; and in 1975, he returned to Holy Family parish to serve that flock in semi retirement until his death. Father Fernandez was replaced by Father Angel Villalba, OMI, who also came to Our Lady Of Good Counsel from Holy Family parish. Little did the parishioners expect that this vibrant and invigorating Spanish priest would be around to serve the parish for over 14 years as pastor. Our Lady of Good Counsel thrived under Father Villalba. His spiritual and material accomplishments were numerous. under his leadership, the Confraternity of Christian Doctrine (CCD) program, Cursillo movement, charismatic prayer groups, Ladies of the Altar, Sociedad Catolica Mutualista, Eucharistic Ministers, lectors, and altar boy activities thrived. Father Villalba's zest and energy was inspiring. Besides ministering to the spiritual needs of his parish, he was deeply involved in the diocesan communication program, wrote weekly columns for the South Texas Catholic, and produced weekly radio and television programs in which he involved a large number of his parishioners. Materially, the exterior of the church was bricked, the annex and chapel were built and joined to the parish hall sound systems were improved, and a comprehensive parish expansion plan was put into place. More land was acquired across the alley from the church for parking. Property was acquired from the Flores family to build the present rectory and from the San Miguel family to expand the parking lot east of the parish hall. Fundraising projects and festivals were held throughout the year to finance the many new programs spearheaded by Father Villalba. When the parish council decided to expand the CCD program, unsuccessful attempts were made to purchase the property behind the rectory where it was hoped to build a new CCD Center. The Diocese of Corpus Christi got involved in the negotiations and eventually purchased the property where the former CCD Center is located on East Yoakum Street. They helped secure grants to finance the building and the Center was completed in the mid-1980's. As the decade of the came to a close, the Catholic Church found itself in a crisis of vocations. Religious orders, such as the Oblates of Mary Immaculate found themselves with a shortage of priests. The Oblates served the Diocese of Corpus Christi, but priestly assignments to Oblate parishes were made by the Oblates of Mary Immaculate Provincial Director. Since its inception, Our Lady of Good Counsel has been an Oblate parish. In 1989, upon the reassignment of Father Angel Villalba to Our Lady of Guadalupe Church in Sarita, the Oblates of Mary Immaculate announced that they would no longer be able to provide a priest for our Lady Of Counsel, and Bishop Rene Gracida appointed the first diocesan priest as pastor, Father Matthew Stephan. Father Matthew served as pastor until 1992 when he was transferred to Sacred Heart parish in Falfurrias. He was succeeded by Father Gregory Boensch who served as pastor for a short while before being transferred to St. Anthony's in Violet in 1993. Because of the shortage of Catholic priests, Our Lady of Good Counsel found itself without a pastor for nearly 18 months. Deacon Jerry Trevino was assigned as parish administrator by Bishop Gracida during this period. Deacon Trevino arranged for priestly services, and most weekends saw various priests from the order of the Society of Our Lady of the Most Trinity in Robstown coming to Our Lady Of Good Counsel to hear confessions and to celebrated Mass. In 1994, Father Michael Lenihan was appointed pastor by Bishop Gracida . Deacon Trevino remained as administrator until 1995 when he moved to San Angelo. Deacon Tony Barbour was later assigned to the parish until his departure in 2001. Father Mike Lenihan worked hard to improve the spiritual life of the parish. Among his many accomplishments was the establishment of the parish bereavement committee, which caters to provide a meal to members of the family of deceased parishioners after funerals. Materially, during his administration, the parish acquired the rest of the property to the east of the parish hall; and plans were begun to move the CCD Center closer to the church grounds. In 1998, upon the retirement of Bishop Gracida and his succession by Bishop Roberto Gonzalez, as is customary of diocesan priests, Father Mike submitted a voluntary letter for reassignment at the will of the new bishop. Father Mike's letter was accepted and in 1999 was transferred to St. Mary's Star of the Sea parish in Aransas Pass. In 1999, Father Piotr Koziel was appointed pastor of Our Lady of Good Counsel by Bishop Roberto Gonzalez. A recently-ordained young priest, Father Piotr did much to improve the spiritual life of the parish and worked exceedingly well with the young people of the parish and with the students of the university here he also ministered as chaplain. Among his many material accomplishments, Father Piotr has the interior of the church remodeled to expand the confessional spaces, remodeled the parish hall interior, and established an improved sound system for the church. Spiritually, he is best known for leading the parish youth group to care for the graves of many unidentified graves in Kenedy county of undocumented workers who died in the brush country in search of a better life in United States. In 2002, Father Paul Puthenangady was appointed parochial vicar of Our Lady Of Good Counsel and assigned to assist Father Piotr. Father Piotr was appointed pastor of St. Gertrude's parish in Kingsville in 2003 by Bishop Edmond Carmody, and Father Paul Puthenangady was made pastor of Our Lady Of Good Counsel. Deacon Arturo Flores was assigned to assist Father Paul. A proactive and dedicated priest, Father Paul can be seen on a daily basis ministering to his parish and to the people of Kingsville. He reestablished daily morning Mass and perpetual adoration services at Our Lady of Good Counsel and ministers to the local hospital and nursing homes regularly. During his short tenure, he has already been successful in acquiring the property behind the rectory at 1100 E. Yoakum; and plans are underway for the development of a new CCD Center there. Other plans include the establishment of an Adoration Chapel at our Lady of Good Counsel. January 6, 2010 Father Paul was called back to his home diocese in India. Father Peter Thenan took charge as the new administrator on the same day. The spirit you see and feel when you visit with the good and generous people of Our Lady of Good Counsel Church in Kingsville has been fostered by the 16 priests and three deacons who have inspired and dedicated their lives to the people of the parish since 1954. Their measure is not how great their faith was here, but how great their love for us continues to be. Through their leadership, parishioners have advanced step-by-step to a where they feel that they have, in the last fifty years, achieved the goals most necessary to fulfill their spiritual needs. Today, over 400 families are registered as parishioners. Much still remains to be done. And the best is yet to come. You who read this history of this parish is invited with much love to become a part of this history and contribute your share by joining in our faith, vision and mission.